If I had to give up any one month of Northeastern United States birding, April might just be the one. Winterâ€™s own waterfowl and arctic specialties have finally flown, but the bulk of springâ€™s migrants have yet to arrive. Yes, some travelers do trickle in each week, including the first warblers of the season. But since I destined to be denied a decent look at an American Woodcock, Iâ€™d just as soon spend April abroad to return for May migratory fireworks. Unfortunately, Iâ€™m not going anywhere this April, so the Core Team determined to make the most of this past weekend by getting outside before the deluge hit. The second largest recorded amount of rainfall in NYC history puts a damper on even the most ambitious weekend plans. But we were lucky enough to make it to Marshlands Conservancy the day before the skies broke. The big draw of Marshlands Conservancy is an easy path that puts you right on the Long Island Sound. The rugged, mussel-encrusted shore promised lots of â€œseaweed adventuresâ€ for Mason; he finds scrambling across perilously slick rocks just to ravage another bed of bladderwrack, popping each vegetable balloon between his little fingers, to be great fun. Keeping one close eye on my intrepid offspring, I focused the other on my first Osprey of the season, newly settled into the local platform. The sound still sustains plenty of Buffleheads, along with the usual waterfowl, but I also spied possible scaup, goldeneye, and a lone loon, probably Red-throated, in the distance. I also noted a pair of flashy Greater Yellowlegs, a set of Snowy Egrets, and possibly a Willet, though Iâ€™m not sure about that last one. The land birds were all expected species, from the iridescent Wild Turkeys that greeted us to the common woodpecker species â€“ Downy, Red-bellied, and Northern Flicker â€“ that followed as along the trail. Iâ€™m always happy to see titmice, jays, cardinals, mockingbirds, robins, and the like, but the songbirds that sustained me through winter arenâ€™t enough anymore. 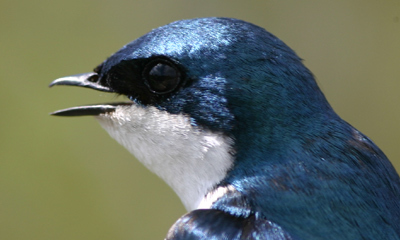 Thatâ€™s why I was so happy to see Tree Swallows back in their houses, the uncontested masters of a broad swathe of brown meadow. These agile birds, brilliant in a hundred hues of shimmering blue, are among the first species to arrive in spring. Itâ€™s fitting that they get the stage to themselves for a while, because theyâ€™ve got serious star power! That’s a lovely portrait. We have lots of welcome swallows (Hirudo neoxena) around work. They’re not quite as brilliantly coloured as your tree swallows but are very engaging birds. The epitome of cute is young welcome swallows lined up on the balcony railings in between practice flights. It’s funny that I – as a foreigner who is new to the slow change of seasons in North America – noted the same: April is not all that very exciting here, the winter birds are gone and spring migration hasn’t really set in yet. It’s WAY different in Europe, but then again, nothing rivals May migration around the Great Lakes. One reason might be that North America, with its lack of high mountain ranges separating the North from the South, is prone to get sudden cold spells even in April and that, while it is already possible for the hardier birds to leave their winter grounds and go back North, April is a far too risky month for southern migrants to return? I was in Chincoteague (VA) the weekend of 4/7-9. It was an excellent mix of winter lingerers and spring arrivals. And there were MANY Tree swallows shimmering in the direct & reflected sunlight around all the pools & ponds.